Be the first to share your favorite memory, photo or story of Robert "Butch". This memorial page is dedicated for family, friends and future generations to celebrate the life of their loved one. 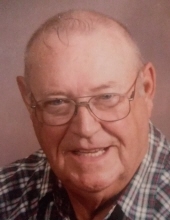 Robert “Butch” Lloyd Basner, beloved husband, father, grandfather, great grandfather, brother and uncle passed away at his home in Crump Michigan the morning of April 10th, 2019 at the age of 77. Robert, the son of the late Samuel and Emma (Cain) Basner, was born on March 30th 1942 in Bay City Michigan. He married Meredith Seaman on November 2nd 1963 and had their two loving daughters. He proudly served in the United States Navy. Butch retired from GM, but also worked for Dobson’s Ambulance/Stapish Cederberg Funeral Home. He was also a member of the Bay County Sheriff’s Mounted Division, the American Legion Post 239 and The Church of Daniels Band. He had a love for playing music and camping with his family. Butch is survived by his wife Meredith, daughters Barb (Garold) Foor and Sally Basner, 2 grandchildren Josh (Arlene) Foor and Jessica (Evan) Vennix, 4 great-grandchildren Owen, Avery, Logan and Jase, 3 brothers Dewey Basner, Sam (Gail) Basner and Ken Basner, and many nieces and nephews. He is predeceased by his brothers Mike Basner and Harry Basner and sisters in law Lorraine Basner and Darlene Basner. Family will be present at Rivertown Funeral Chapel in Kawkawlin MI, Monday April 15th 2019 from 10AM until the time of a memorial service beginning at 4PM. To send flowers or a remembrance gift to the family of Robert "Butch" L Basner, please visit our Tribute Store. "Email Address" would like to share the life celebration of Robert "Butch" L Basner. Click on the "link" to go to share a favorite memory or leave a condolence message for the family.